Truly Labs presented, together with Dept. Translational Medicine, Medical Radiation Physics, a poster at ERS in Paris. 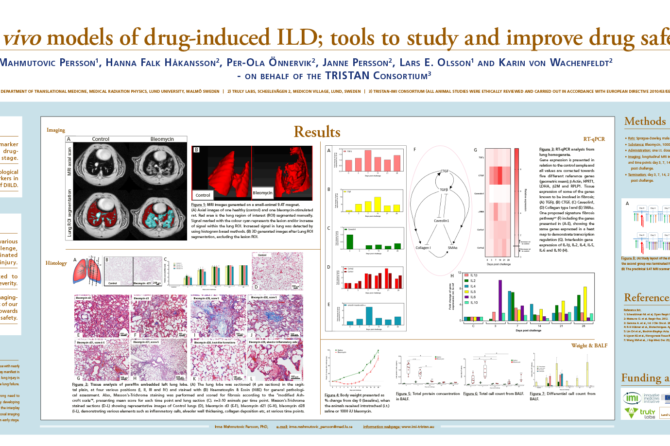 The poster describes our work with in vivo models of drug induced ILD. The work is being done within the TRISTAN-IMI consortium and aims to find better tools to study and improve drug safety using imaging biomarkers. To address the increasing issue of drug-induced toxicity, both clinical and pre-clinical studies (within our EU-IMI funded project TRISTAN) are aiming to find translational Imaging Biomarkers that can indicate progression of drug-induced injury at an early stage. Various imaging techniques such as MRI, PET and CT are used in association to todays established analysis methods such as histology, cell- and protein analyses.